Norm Architects of Denmark used industrial pendant lights, woollen blankets and reclaimed wood to create rustic Scandinavian dining rooms at Höst, a new restaurant in Copenhagen. For Höst, the designers tried to combine traditional Scandinavian cosiness with minimalism, incorporating weathered materials such as recycled wooden planks and pallets. "The theme has been to transform the feeling of eating outside on a Scandinavian farmyard in rural settings to an urban and more minimalist indoor context," Jonas Bjerre-Poulsen told Dezeen. Wooden shelving units screen a private dining area at the back of the restaurant, while reclaimed windows salvaged from an old hospital line the edge of a conservatory. Dining areas also occupy the basement, where vintage wooden chopping boards hang from the walls and high-back chairs offer more comfortable seating. The designers created a collection of tableware especially for the restaurant, which includes basic white plates and dishes, alongside blue and grey pieces and slabs of granite. "We tried to see if we could find a balance where the interior, the dinnerware and the food told the same story, without it being too old-fashioned or too much of a theatrical backdrop," said Bjerre-Poulsen. Stools designed by Norm Architects for &tradition sit beside the bar, while small pendant lights are clustered together to create a chandelier in the stairwell. See also: our recent feature about Copenhagen eatery Noma, the best restaurant in the world, as well as two restaurants at Grand Hotel Stockholm in Sweden by Ilse Crawford. Photography is by Jonas Bjerre-Poulsen. 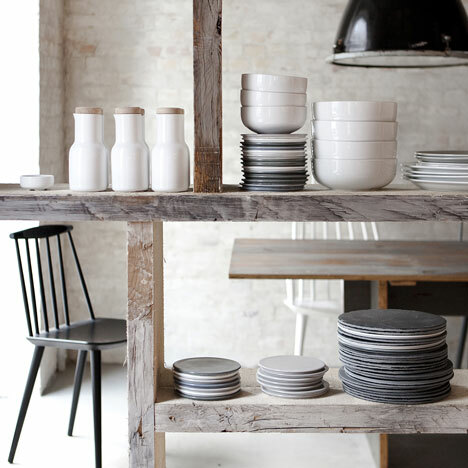 Höst and New Norm Dinnerware – a symbiotic relation of contrasts Norm Architects and Danish designhouse Menu have joined forces with Copenhagen restaurateurs Cofoco, to create a distinctly urban restaurant with obvious romantic and rural references. Höst is an embodiment of the clash between romanticism and modernity. A space of multiple stories intertwining and correlating to form an inspirational and aesthetic universe for all senses. An obvious and reoccurring characteristic of both concept and cooperation is the juxtaposition of elements. Höst is rustic gone simplistic. Rural gone urban. Past gone contemporary. The classic virtues of Nordic cooking have found its contemporary counterpart at Höst. In the kitchen traditional ingredients are combined with the visions characterizing New Nordic Cuisine. And in the restaurant loads of green plants, woollen blankets and the warmth of used wooden planks soften and complement the tight no-nonsense architectural aesthetic so distinct for Norm. Furthermore, Norm has ventured into sustainable interior design by implementing details such as cut-up Euro-pallets, vintage lamps and even windows from an old hospital. Norm and Menu have designed and produced New Norm Dinnerware exclusively for Höst, and if you dig deep you will find a hidden world of Scandinavian taste. On several levels modernity and interaction become evident in New Norm Dinnerware. The multitude of parts, materials and colors provides numerous possibilities and expressions, and when you flip over certain parts, you will find an entry to www.newnorm.dk, an online inspirational universe of everything distinctly Scandinavian - from moods and designs to produce and recipes. The juxtapositions found throughout Höst and New Norm Dinnerware serve as the foundation for a symbiotic relation that comes to define what is “New Nordic”: A timeless aesthetic rooted in traditions and driven forward by visions.